Design Summary: The Delivery consists of a heavily modified Varuna-class spacefaring vessel, constructed from the salvaged remains of FSFL Galaxy Cruiser (see Dispatch Timeline). Much of the vessel's internal space has been sacrificed to accommodate an oversize, reinforced storage bay. Basic landing struts have also been added, and the ship's external structure has been reinforced to allow the ship to alight on planetary surfaces. See below craft specifications for more information. For security reasons, the structure and placement of the vessel's FTL drive systems have been removed from this schematic. Level 3-Heimdall clearance is required for access. Craft Purpose: The FSF Delivery is a combined planetary scouting and resource-gathering craft for the Foundation Space Force. Equipped with an enlarged storage bay and specialized scanning, mining, and storage devices, the Delivery is dispatched to planets of interest within the immediate stellar vicinity of the greater FSF fleet, at a maximum range of one light-week. After approaching the interstellar body in question, the ship scans to acquire more detailed information for the fleet. If appropriate, the Delivery then lands on the planet and secures all resources necessary for FSF use, as well as any detected anomalous objects ascertained to be relatively safe to handle. 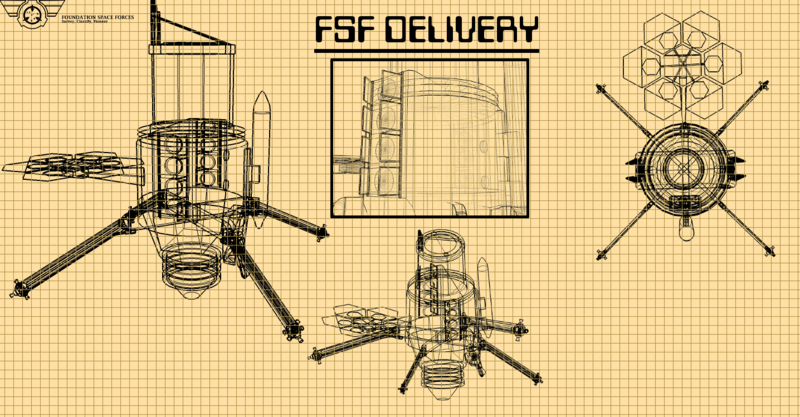 The Delivery has been outfitted with a variety of experimental FSF equipment beneficial to its primary mission. This both expedites resource gathering and allows for field-testing of newly-developed FSF technologies. Due to the high level of risk already accepted by the crew members of the Delivery, as well as the relative ease with which the basic craft can be replaced, it was considered the optimal ship for early trials of emerging FSF technical components. See Experimental Components for more information. Note: Only dispatches of unusual significance have been recorded here. For a full dispatch history, including approximate dates and galactic coordinates of dispatches, please contact FSF Information Services and submit appropriate credentials. Notes: Maiden voyage of FSF Galaxy Cruiser, an unmodified Varuna-class vessel. Target isotopes were successfully harvested from Planet 0-0037, though problems were encountered during transportation. Inability of the vessel to properly alight on the planetary surface made transfer of materials from planet to craft difficult. Lack of proper containment of recovered materials within the craft was also a noted concern, especially during artificial gravity spin-up. Due to heavy damages sustained during resource gathering, the Galaxy Cruiser was rendered inoperable, and a rescue mission was necessary to recover the craft and its contents (for more details, see Dispatch Summary Rec-0004). FSF Galaxy Cruiser was scuttled following Dispatch Res-0001, with its parts used in the construction of FSF Delivery. Notes: Maiden voyage of FSF Delivery. Notes: Target resources successfully acquired. In addition, a low-level anomalous object (AO-████) was identified and secured by crewmembers, marking the first anomaly identified and secured by members of this craft. Notes: Planet 1-0164 was identified as a potential candidate for extensive plant growth. FSF Delivery sent to confirm presence of plant life on planet, and obtain samples for study. Numerous samples acquired, revealing a forest ecosystem similar to those seen on Earth. Target: Lumber for use in construction, printing, etc. Notes: Crew of Delivery encountered previously unnoticed native intelligent life forms, living in a primitive tribal structure (classified as LF-0019). LF-0019 demonstrated hostile behavior, resulting in the deaths of two crew members. Notes: Specimen of native intelligent life successfully recovered. Life form officially classified as LF-0019. Notes: Planet gravity higher than initial scans indicated, resulting in inability to secure target ore, the death of a crew member, and heavy damages to craft. Delivery scanners upgraded in response to incident. Notes: Resulted in death of crew member. One other member resigned from service following incident. For more information regarding Res-0051, contact FSF Information Services and submit appropriate credentials. Notes: First test of newly acquired faster-than-light travel equipment obtained via SCP-1822. Craft navigator lost during operation of said equipment and deemed unrecoverable. Return trip took longer than projected due to lack of navigator. For more information on FTL travel equipment, see Experimental Components. Notes: Failure to properly interpret planetary scan data resulted in failure to preemptively identify hazardous electromagnetic properties of the unidentified material composing much of Planet 2-0130. Material acquisition attempt resulted in death of crew member and heavy damages to ship. Materials analyst placed on crew to prevent future incidents of this nature. Plasma Lash-based Handheld Scoring Device (PLHSD) - To aid in the excavation of particularly hard materials, the PLHSD utilizes the "plasma-lashing" principle recently discovered by FSF researcher Jeremy Cutt to produce a superheated edge capable of scoring most known materials. Each member of the Delivery is equipped with a PLHSD approximately 0.75 m in length. Known flaws - PLHSDs have been known to periodically activate their cutting edge without prompting. To prevent accidental burns, each member of the Delivery has been provided with a hip-mounted insulated storage device. Hypervelocity coilgun kinetic output amplifier module (official name pending) - To compensate for the Delivery's reduced number of 'Naagastra' hypervelocity coilguns, the vessel's remaining coilgun has been outfitted with a module to allow firing of an ultra-high-density multipartite projectile, rather than conventional coilgun ammunition. This increases the weapon's destructive force per shot. Known flaws - The amplifier module significantly increases the recoil experienced after firing. In addition, the module has not yet been optimized for use simultaneously with standard Varuna-class gravitational spin, necessitating spindown before the weapon can be fired accurately. SIDE-B multi-vector refractive targeting system - Intended to further compensate for the Delivery's lack of offensive firepower, it has been outfitted with the SIDE-B, allowing modified laser weaponry to direct fire from multiple firing ports. Known flaws - Laser fire directed via the SIDE-B system exhibits reduced efficacy in comparison to fire directed from default firing ports. Also, due to the expanded cooling systems required for the operation of the SIDE-B system, additional firing ports can only be mounted laterally. Hyperspace-based faster-than-light travel equipment - During early bargaining with SCP-1822, the FSF was provided with a method of achieving faster-than-light travel and instructions for use as a sign of goodwill. The primary component of the set is a computer program titled "way_point" coded in what appears to be a heavily modified version of BCPL. In order to function, the computer running way_point must be connected to a printer and 3D scanning equipment (provided by SCP-1822, though investigation of peripherals has yielded no anomalous components), as well as given access to the autopilot of the ship using the program to travel. Upon entering the x, y, and z coordinates of a desired destination, the program prints a square map 30 centimeters to a side, as well as displaying an "optimal fold number". This number generally increases as the distance from the vessel to the desired destination increases. Maps produced via way_point may contain a variety of markings, including but not limited to markings resembling topographical lines, jet streams, weather fronts, and ocean currents. However, all maps consistently contain two instances of the numeral "X". To initiate FTL travel, the produced map must be folded such that the two "X"s make contact with one another, and the resulting figure created by the folded map must be scanned into the computer running way_point. The program will then plot a course using the ship's autopilot. Upon the activation of this course, the ship in question will be rendered undetectable to all known scanning equipment, reappearing approximately 34 minutes later at the desired destination. This method can be used to navigate to any location within one lightweek of the affected ship, giving it the potential for the fastest travel speed afforded by any method currently known to the FSF. However, due to the unpredictability of this method (see below), use is restricted to the Delivery until more data is collected. Known flaws - Crew members report psychological distress, up to and including audiovisual hallucination, during navigation initiated by way_point. Initiating travel using a map folded fewer times than the displayed "optimal fold number" increases the severity of these hallucinations and may result in damage to or disappearance of vessel components and/or crew members (see Dispatch History). Consequently, basic understanding of origami techniques has been deemed mandatory for any navigators working with this method of FTL travel. Introduction: In light of the high risk implicit in assignment to the FSF Delivery, the use of an experimental psychological buffer protocol has been authorized in an attempt to mitigate the extreme stress levels experienced by Delivery crew members. At present, the use of this protocol is restricted to the crew of the Delivery. History: This protocol was originally proposed by Captain Chance Sarridge following dispatch Res-0001 and rejected by FSF command. It was later reexamined following dispatch Res-0006, when routine psychological evaluations revealed the heightened possibility of psychological breakdown across all members of the Delivery's crew. Due to the significant resource drain created by proposed alternatives (providing psychological counseling following each dispatch, placing a large pool of FSF personnel on rotation as crew members of the Delivery), the protocol was tentatively approved. For further documentation regarding the proposal and approval of this protocol, please contact FSF Information Services. Observed success: Use of this protocol appears to have been relatively successful in reducing crew stress levels. Though Delivery crew members still exhibit above-average stress levels for active FSF personnel, only one member of the vessel has voluntarily left service to date, far below the number predicted by psychological evaluations predating the protocol's approval. It is unknown if the protocol would see similar success on a vessel of different crew size or purpose. Details: Under this protocol, crew members are held to an alternate standard of operation, as specified by their captain. This is intended to create a semi-immersive fictional backdrop for crew members, reducing the emotional impact of frequent high-stress situations. The fictional backdrop has been drawn from widely shared cultural and historical background, so as to be easily-accepted. Altered command hierarchy - All crew members report directly to the captain with equal priority. Removal of sleeves, application of patches, addition of small-sized accessories, limited application of dyes, alternate casual headware, etc. "Barque" (Lucifer-class vessel), "brigantine/lugger" (Hourmazd-class vessel), "sloop" (Varuna-class vessel), "Bittacle" (navigational computation area), "fo'c'sle" (command bridge), "dead reckoning" (vessel coordination using backup navigational tools), etc.